On November 2, 2016, about 1100 eastern daylight time, an Aviat Aircraft Inc. A-1B, N54HY, was substantially damaged after it impacted a fence during a precautionary landing near Geneva, Florida. 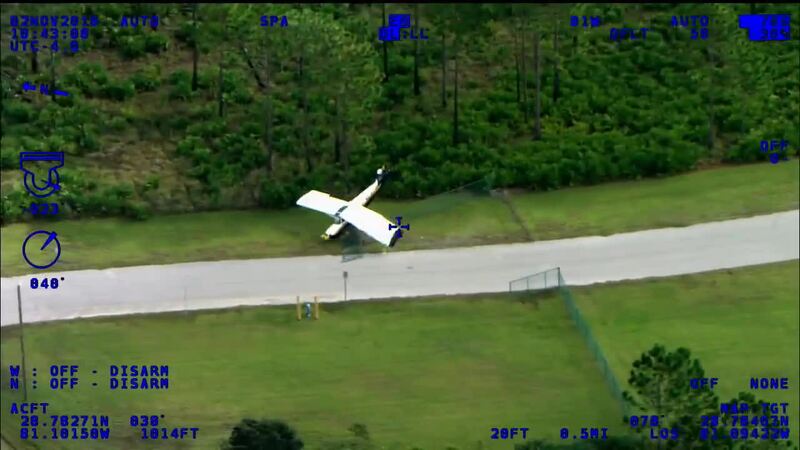 The commercial pilot was not injured. Visual meteorological conditions prevailed, and no flight plan had been filed for the banner tow flight that was operated under the provisions of 14 Code of Federal Regulations Part 91. The flight originated from Massey Ranch Airpark (X50), New Smyrna Beach, Florida, around 1050, with an intended destination of Orlando Executive Airport (ORL), Orlando, Florida. According to the pilot, he performed an engine run up prior to departing X50 with no anomalies noted. About 10 minutes into the flight, the engine began to "run rough." 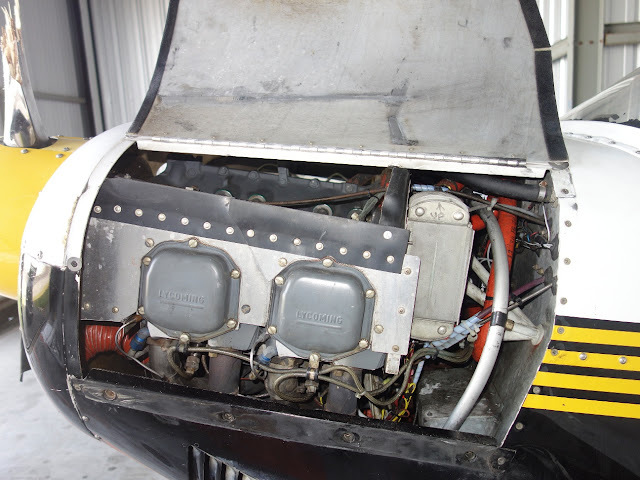 The pilot adjusted the throttle, propeller lever, mixture, and carburetor heat; however, the engine started to backfire and continued to lose power. About that time, he noted a race track below the airplane and elected to perform a precautionary landing. He made a spiraling descent from about 1,000 feet above ground level in order to warn the personnel on the track and maneuvered the airplane to land on a paved area. 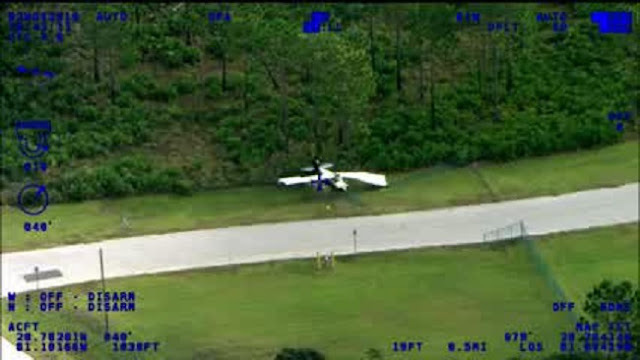 During the landing roll, the airplane came to rest after it struck a fence. The pilot stated that the engine continued to operate throughout the landing and landing roll until the airplane struck the fence. According to Federal Aviation Administration (FAA) records, the airplane was issued an airworthiness certificate 2001. It was equipped with a Lycoming O-360-A1P, a 180-hp, engine. According to the airframe maintenance logbook, the most recent annual inspection was performed on September 3, 2016, at a total time of 4,571.3 hours. The airframe total time at the time of the accident was 4,650.3 hours. An examination of the airplane revealed substantial damage to the left wing. An undetermined amount of fuel was removed from the airplane during the recovery. Engine crankshaft continuity was confirmed from the propeller to the accessory drive section. The spark plugs were removed, and it was noted that the cylinder No. 1 top and bottom spark plug electrodes exhibited mechanical damage. The electrodes had become displaced and shorted to the center electrode. No mechanical damage was noted on the other spark plugs. Furthermore, the No. 1 piston looked like it was "sandblasted" when compared to the other cylinders. The left magneto generated spark on all towers. The right magneto generated spark on only one tower. Maintenance was performed on the engine on October 31, 2016, to troubleshoot "hard starting, low static RPM, and a rough engine." The maintenance entry indicated that both No. 1 spark plugs were damaged. Subsequently, eight new spark plugs were installed on the engine, then "test runs show smooth mag[neto] drops, leak and op[erational] checks good." Photographs of the No. 1 spark plugs removed during maintenance on October 31, 2016, revealed that part of the ceramic section around the massive spark plug electrode was absent and mechanical damage was noted on the center and ground electrodes. Furthermore, a comparison of the photographs between the spark plugs removed on October 31, 2016, and the spark plugs removed after the accident flight showed similar mechanical damage between the two sets of spark plugs from the No. 1 cylinder. Further disassembly of the engine was performed under FAA oversight. The intake system, the carburetor box, the carburetor, the exhaust system, and the No. 1 cylinder were examined with no debris noted inside the components of the engine. On November 2, 2016, about 1100 eastern daylight time, an Aviat Aircraft Inc. A-1B, N54HY, was substantially damaged after it impacted a fence during a precautionary landing near Geneva, Florida. The commercial pilot was not injured. Visual meteorological conditions prevailed, and no flight plan had been filed for the personal flight that was operated under the provisions of 14 Code of Federal Regulations Part 91. The flight originated from Massey Ranch Airpark (X50), New Smyrna Beach, Florida, around 1050, with an intended destination of Orlando Executive Airport (ORL), Orlando, Florida. According to the pilot, he performed an engine run up prior to departing X50 with no anomalies noted. About 10 minutes into the flight, the engine began to "run rough." The pilot adjusted the throttle, propeller lever, mixture, and carburetor heat; however, the engine started to backfire and continued to lose power. About that time, he noted a driving track below the airplane and elected to perform a precautionary landing. He made a spiraling descent from about 1,000 feet above ground level in order to warn the personnel on the track and maneuvered the airplane to land on a paved area. During the landing roll, the airplane came to rest after it struck a fence. The pilot stated that the engine continued to operate throughout the landing and landing roll until the airplane struck the fence. 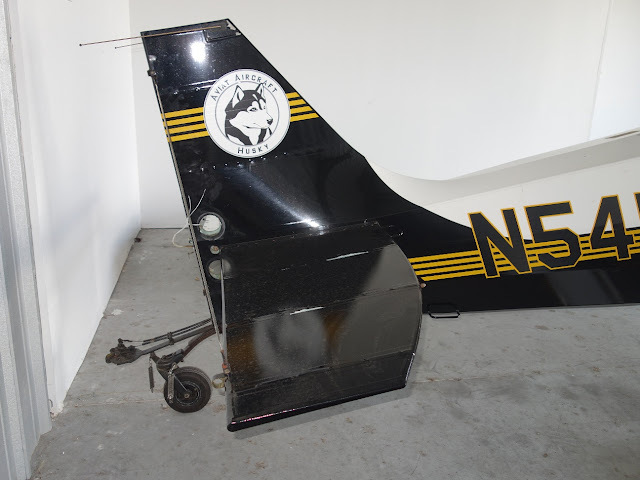 An examination of the airplane revealed substantial damage to the left wing. An undetermined amount of fuel was removed from the airplane during the recovery. Engine crankshaft continuity was confirmed from the propeller to the accessory drive section. The spark plugs were removed and it was noted that the cylinder No. 1 top and bottom spark plug electrodes exhibited damage. The left magneto generated spark on all towers. The right magneto generated spark on only one tower.